Bark Beetles: Biology and Ecology of Native and Invasive Species provides a thorough discussion of these economically important pests of coniferous and broadleaf trees and their importance in agriculture. It is the first book in the market solely dedicated to this important group of insects, and contains 15 chapters on natural history and ecology, morphology, taxonomy and phylogenetics, evolution and diversity, population dynamics, resistance, symbiotic associations, natural enemies, climate change, management strategies, economics, and politics, with some chapters exclusively devoted to some of the most economically important bark beetle genera, including Dendroctonus, Ips, Tomicus, Hypothenemus, and Scolytus. 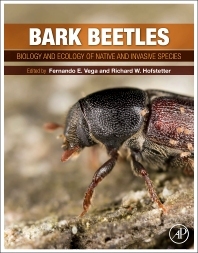 This text is ideal for entomology and forestry courses, and is aimed at scientists, faculty members, forest managers, practitioners of biological control of insect pests, mycologists interested in bark beetle-fungal associations, and students in the disciplines of entomology, ecology, and forestry. 2 What are bark and ambrosia beetles?